Get to the vet! First thing’s first, make sure your pet’s vaccinations are up to date. Get a health certificate and keep it with you as you travel. You will need this if you plan on boarding your pet or when traveling with pets across state lines. You may also want to have them check for worms or other issues that might complicate travel. Do this in enough time to treat any parasites or infection prior to hitting the road. You and your pet will thank me later! Start small. If your pet normally doesn’t travel well or hasn’t traveled a long distance in a while (or ever), you will need to get them acclimated to the environment. Start with just sitting in the vehicle. Have your pet on a leash and let them sniff and take it all in. Do this for a few days. Next, close the doors and start the car. Work your way up to short trips, even if it’s just to the mailbox and back. Eventually, fido will be ready for a road trip without worry. Traveling with pets can be worry free when you plan ahead. Treat anxiety and/or motion sickness. Talk to your vet about medicines that are safe for your pet. Not all meds are safe for animals and some are ok for dogs but not cats, and vice versa. Something as simple as dramamine or melatonin could calm your pet and settle their tummy. But do check with your vet to be sure of safety and proper dosing. Nobody needs to deal with a Fido freak out or Kitty car sickness on a long car trip. It’s not safe. Safety first! DO NOT allow your pet(s) to roam the vehicle freely. In an accident they become deadly projectiles. If your pets are crate trained, this will make for a much nicer trip than if they aren’t. If they can’t be crated, check into a safety harness for pets. This will keep everyone safe and secure. Never EVER leave your pet(s) in the vehicle unattended. Cars can quickly heat up to an unsafe temperature for pets and can cause them great distress or even death. If it’s too hot for you, it’s too hot for them. In the colder months the vehicle can have a refrigerator effect and your furry friend could freeze to death. No food or water while on the move. Food and water should always be secured and never given while the vehicle is in motion. Your pet could choke if a sudden movement is made. Someone could be injured by an unsecured container. Be prepared for vomiting if your pet has to be fed and then put back into a moving vehicle. Accidents happen. Your pet may potty or puke and you need to be prepared. Bring extra towels. Purchase seat covers and rubber floor mats. You want to either be able to throw away or hose off anything that can be soiled. Imagine traveling for hours with either of these smells in the car! YUCK! Two heads are better than one and four hands are better than two. If you have to travel alone plan WAY ahead for every possible incident and accident. If at all possible, travel with a partner. An extra set of hands to calm an anxious pup or to clean up a mess is something you won’t regret! Pack a travel kit. When traveling with pets, it’s best to be prepared with what they need all in one easy place. Important items are: health certification, trip itinerary (including stops) and your cell phone #. Leave an itinerary with your vet and make sure your pet is tagged with your contact info or a microchip that is updated. Also include any meds (with dosing instructions), travel bowls, bottled water, bandages, styptic powder, nail trimmers, an extra collar and leash and bags for picking up poop. Consider sedating your pet. For last minute trips, extra long trips or pets that just do not ever travel well, sedation might be the best option. Whether you use natural methods or prescriptions, always check with your vet for proper dosing and instructions. Traveling with pets can be stressful and sedating them might be a lifesaver for everyone. It doesn’t make you a bad owner, it makes you a smart owner. Knowing your limits as well as your pets means you care and want the best for them. If your pet can’t travel with you, hire a sitter. It’s the best possible thing you can do. Ask relatives and friends for suggestions or see if they will pet sit for you. If you aren’t traveling with pets, you will be more at ease knowing they are cared for and safe. Your vet, a local rescue and the internet are all great sources for finding a reliable pet sitter when traveling with pets just isn’t an option. 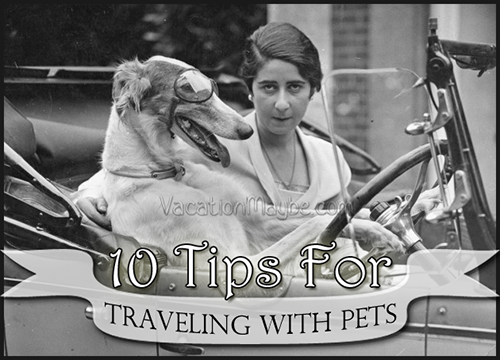 Remember when traveling with pets (or traveling at all) SAFETY FIRST! Great travel tips for our pets!